Yeah, I’m showing my age here. But imagine being a kid growing up in the 1960s. Before DVR’s, Before VHS, before you could watch a favorite show over and over until you were sick of it. Think of a time when “The Wizard of Oz” was an annual event. Once your family actually had one of those new-fangled color TV’s, you found out that the darn movie started in black and white, went to color and then returned to black and white! Who knew? There was also a limited number of kid’s television shows. Well, compared to today’s standards. “Beany & Cecil”, “The Bullwinkle Show”, “The Bugs Bunny/Roadrunner Hour” (with all the violence pulled out) and reruns of “The Mickey Mouse Club.” Yeah, I wasn’t old enough to be there for them when they first aired, but these were the fairly early days of television, when only a few shows were rerun. If you didn’t know, that’s how the 3 Stooges enjoyed such a revival in those days, as their shorts from the 1940s were put into half hour shows. Then there was “The Mickey Mouse Club”. I remember I loved the episodes where they showed Disney cartoons, but loathed the ones where they did a serial about wholesome Disney characters I didn’t care about, like “Spin & Marty.” Who? The real reason I tuned in was the Mouseketeers. At the age I was watching this, I thought the little blonde named Karen. Then there was Cheryl. And, of course, Annette. 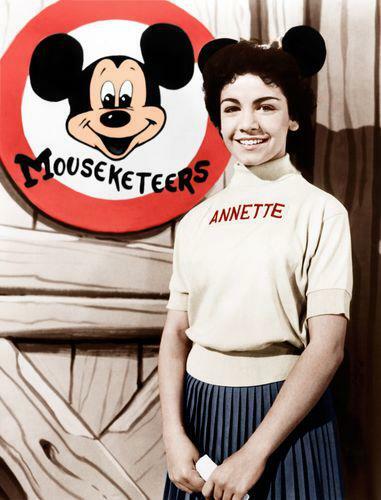 I never crushed on Annette. She was older and, at the time, more the age of someone who would babysit me. At a time in my life when baseball games and baseball cards and playing with the friends was so much more important, I wasn’t really into falling for a cutie on TV. But Annette stood out. She would often talk with her hands behind her back, like she was shy. She was nice. She was cute. Then she went into the beach movie phase of her life and, as I got older, I grew to appreciate the films with very little plot and bathing suits to match. All the while, she was Annette. You didn’t have to say her last name. If you referred to Annette, you knew. Yep, you just knew. And so, with that, another plank from the deck of my childhood is gone. I watched her life from afar and hope she was a nice as she seemed and that her journey was a happy one. I imagine the disease she battled had a part in her passing at only 70 years old. I remember a time when 70 was really old. I also remember a cute Italian girl wearing a sweater and Mickey Mouse ears with one of the greatest, most friendliest smiles you’d ever seen. She was known by only one name and I have only one word to say: thanks!